This was completed 2 weeks ago, but I am only now getting around to posting it online. This experiment was purely for the fun of it – I don’t own (or want) a cell phone, and have never used Android. However, it is an interesting operating system, and I always enjoy playing around with such things – it’s the process more than the end result. 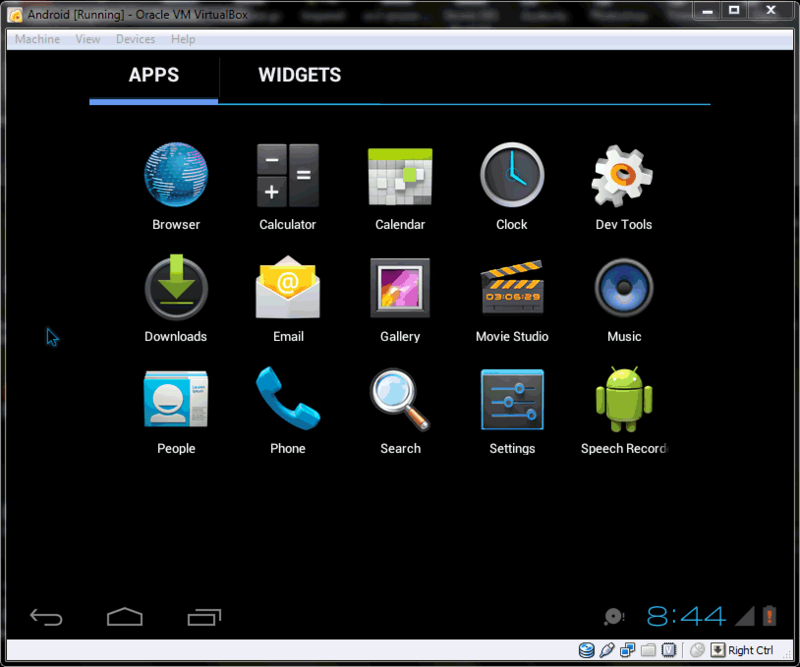 Android 4 – Ice Cream Sandwich (ICS) is more compatible with x86 architectures than previous versions, and even includes a VirtualBox make profile. The default build, however, lacks a few things. Notable among these are mouse support, and network DNS (networking is enabled though). One of the differences in my approach, is that I used Amazon’s EC2 to do my compiling (mostly because it let me download the few GB of files in a few minutes, and I could throw as much disk space and processor power as I wanted at the task for relatively minimal cost). Since EC2 has a variety of instances, it helps to know what is the limiting factor in compiling – CPU, memory, or I/O. I/O is dealt with by using a RAID0 array of ephemeral disks. The xlarge instances provide 4 ephemeral disks, which can easily be assembled into a RAID0 set using mdadm. It is worth noting that while many reports do suggest that EBS volumes are faster, with a 4 disk RAID, the performance should be acceptable (and without the cost that would be incurred by using EBS). That leaves RAM vs CPU. My observations found that the entire process needed about 3GB of memory (although, the Android site recommends 16GB, including swap), but that CPU was easily maxed out. I tried both m2.xlarge and c1.xlarge instances for this task – there really wasn’t as big of a difference as I would have expected (although, the processes weren’t run with the intention of comparing the instances). I would favour the c1.xlarge for this task. The c1.xlarge has 8 cores (’20 ECUs’) and 7GB of memory – it is comparable to a mid-high end desktop, clocking in at about 75GFLOPS. The recommended operating system for building Android is Ubuntu 10.04 – however, for interest sake, I opted to use, Ubuntu 11.04. I chose a instance-store AMI (ami-21f53948), since these include the ephemeral storage by default (and have no disk cost associated with them). (The intent here being to save some setup time and, of course, keep costs to a minimum). To get started, we create a spot request, for one c1.xlarge instance, in any availability zone. At the time of writing, the spot price was $0.216/hr (which is a bit more than the spot price of the m2.xlarge, at $0.153, although, the latter has more variation). Unless you are im a particular hurry, the spot instances are the most cost effective for a fairly short task – just remember to overbid somewhat to prevent unwanted termination in the middle of your task. Once the instance launches, SSH into it using your keypair (and the username ‘ubuntu’). If, like me, you aren’t used to using Ubuntu AMIs, the default settings (lack of scrollback, status bar at the bottom, the idea of ‘windowed sessions’, etc.) will be a bit alien at first, but it does grow on one. We will begin by getting the instance up to date and installing the necessary dependencies. One point of mention is that Ubuntu 11.04 uses GCC v4.6 – which is not compatible with the Android code (it needs v 4.4). Since all of the initial commands need elevated privileges, I like to run sudo in interactive mode initially. Just be aware of what you are doing (even if this is a ‘throwaway’ instance). Alternatively, you can prefix each of the first few commands with sudo. Now, of the three major determinants of compile speed (CPU, memory, and I/O) the choice of instance type has addressed the first two, and partly addressed the third. Given 4 ephemeral disks, and at the cost of a few CPU cycles, we can assemble them up in a (software) RAID0 setup. We will use the ‘multiple device administration’ tool (mdadm) for creating the softRAID. (Answer ‘y’ (yes) to the warning that the disks contain an ext2fs file system.) and will format it to ext4. The Android documentation recommends a combined total of 16GB of RAM + Swap. We have 7GB of RAM on this instance, but since we have an abundance of available space, we will add 20GB of swap space, on our new RAID0 device. I actually didn’t find the instance needing more than about 3GB of RAM at most during this procedure, but since the setup is easy, there is no harm having the SWAP available. One of the last steps of the compilation process uses Virtualbox’s VBoxManage program to convert an img file to a vdi disk. You can omit this step and do the conversion manually on your own, it works just fine (although, the compile process will display an error at the end if you skip this step). Note, we have finally logged out of the root user account – the rest of the steps are done as the user ‘ubuntu’. (The first line above adds the new PATHs to our profile so that if we launch multiple sessions all will have them, the second applies it to our current session). At this point, we are ready to start obtaining the Android source. First we will initialize the repository – the process only takes a few seconds. When asked, enter a name (or alias) and an email address – they are only used if you commit code back to Android, so even a local version will suffice for now. Also, answer ‘y’ (yes) to the two questions. A quick note before proceeding: there is a parameter that shows up in many of the following commands ‘j’. It refers to the number of ‘parallel jobs’ that will be executed. Recommended values vary from <CPU Cores>+1 to 2x<CPU Cores>. There are 8 cores (20ECUs) on a c1.xlarge, so I used numbers between 12 and 16 for CPU limited tasks. For higher numbers, I found a high percent of CPU went was used by the kernel scheduler (i.e. high ‘sy’ value in top). Now to download the source itself – it is on the order of 6GB, so on a normal connection it would take a while – this instance however can download at 300Mbps, so you won’t need to keep this running overnight. This one isn’t CPU limited, so I limited the amount of parallel jobs. (There are some definite pauses in the process, but it completes fast enough). You can go to the next part while this downloads. Now that is a good reason for using EC2 – 9 minutes to download the entire Android source code! Copy and paste key (from: Android Open Source), press Enter and key in Ctrl+D (End of File) to finish. 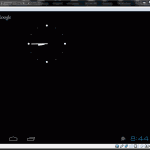 Since Android is meant for touchscreen devices, it doesn’t include support for a mouse pointer by default (although, it does, natively, support a mouse). We need to rebuild the kernel with mouse support if we want to use a mouse. (This is a compiling task, and although short, is CPU intensive – we can do it at the same time as the source download though, since that is more of a network limited task). There are, on the order of 1 million files, in about 230MB. Now that we have the kernel source, we need to modify the configuration and rebuild it. There is a graphical interface that is included that will allow us to do this quite easily. It will take a few seconds to compile and load. Once it does, use Up/Down arrows to navigate, enter to select (i.e. to expand), ‘y’ (or space) to include. Not being accustomed to the interface, I had expected that expanding a category would show all its sub-items. This is only true if you have selected the category first. An unselected category shows no entries – definitely drove me crazy for a time. You can use ‘Esc’ (twice) to work your way out of the program, or repeatedly select ‘Exit’. Remember to save when asked. Having made the necessary change to the kernel configuration, we can now compile it. It doesn’t take too long, so I picked a low ‘j’ value. It is important to note that if you omit the CC and CCX parameters, that the compile will terminates prematurely (on this setup), without an explicit error, as it will use version 4.6. Setup is 11180 bytes (padded to 11264 bytes). The path to the new kernel is displayed on the last line. If the download of the ICS source is complete at this point, you can carry on, otherwise, you will need to take a bit of a break while it finishes. 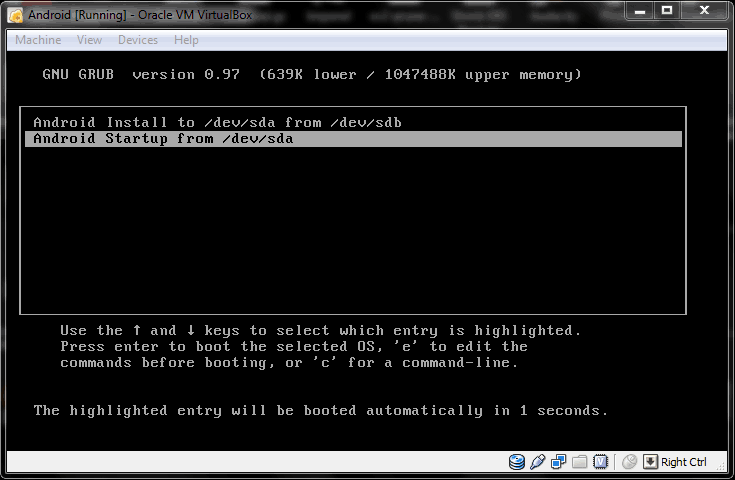 We will copy both our new bzImage and vmlinux to overwrite their ICS versions. I don’t think replacing the latter (vmlinux) is strictly necessary, but it worked fine replacing both. We are now, just about ready to start building the code. Firstly, however, we need to finish setting up our environment. Note: there is a space between the dot and first slash on the above command. The dot is a short form for the ‘source’ command. We are now ready to build. The first step is to select the target using lunch. To initialize the build itself, we run make, specifying the correct compiler. I opted to use a ‘j’ value of 12 which seemed to work reasonably. Recompiling, however, (with the cache enabled) takes only about 15 minutes. File edit complete. Wrote 3 images. Once the above command exits, you can terminate your instance if you do not anticipate needing to make changes to your image. Of course, if you expect to need changes, keep the instance around because everything is already setup, and the compiler cache will save a lot of time. The advantage of this approach is that AWS doesn’t charge for data transfer in, and ephemeral disks have no cost for allocated space or I/Os, meaning that you only pay for the instance time and the download of the final product. 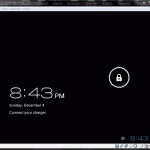 Once you have your compiled image, you need to setup VirtualBox to use it. Save the settings and start the virtual machine. You may get an error about sound and 16bit displays, but dismiss them for the time being. Once it boots up, you may get an error regarding low battery (i.e. Connect your Charger), you can dismiss the page using Ctrl+Esc. To capture your mouse, just click inside the VirtualBox window (to uncapture press the right Ctrl key – or whatever your host key is if you changed it). The speed of the virtual machine was fairly good – everything seemed responsive enough. Stability – not so great – it runs, but you do see the occasional error – luckily it just lets you continue and you don’t need to restart the machine. Storage – the default disk needs to be made larger – this is easy enough, but would be worthwhile change. Battery – displaying as discharged, and starts with Connect Charger screen. Network – wireless doesn’t display as connected (even though there is network access). 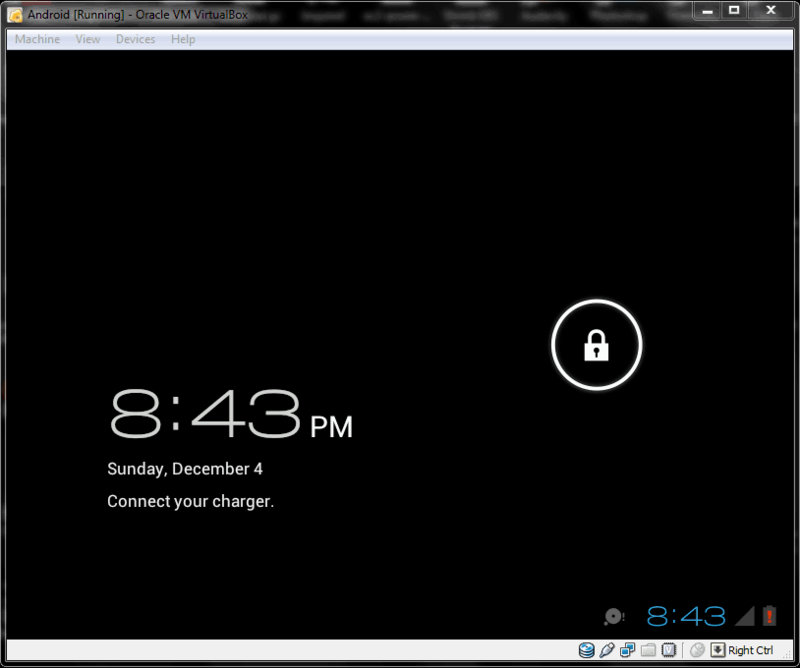 Desktop – can’t set a background – just displays as black with the widgets and controls. 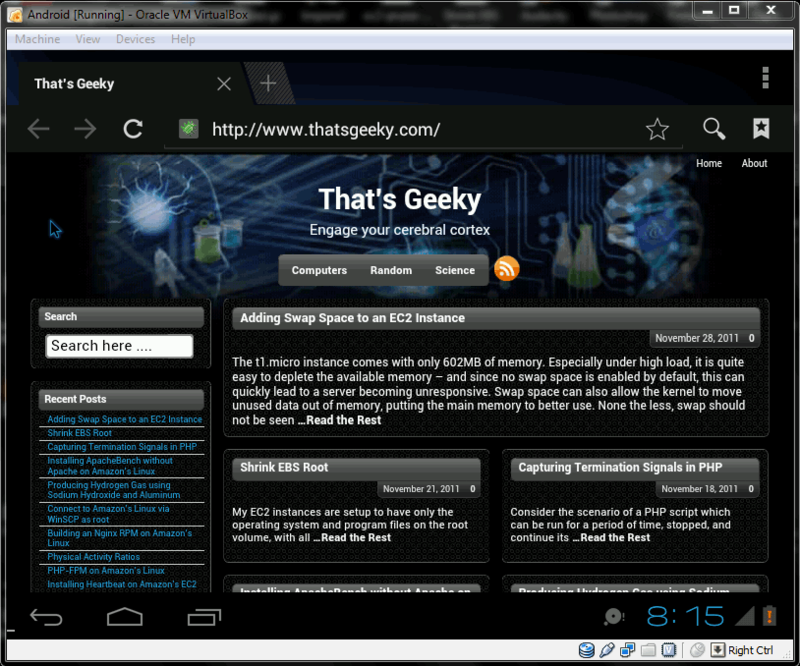 This entry was posted in Multiboot and tagged Android, EC2, ICS, linux by cyberx86. Bookmark the permalink. Very interesting indeed. I may try to follow your instructions someday. Thanks for a good read! Thanks for the comment. Glad you found it interesting. I am not really in the habit of making end products available – my focus being more on the process, but I figure I can make an exception. 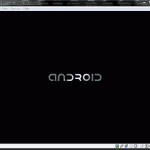 You can download the file (android_disk.vdi – zipped) from http://ge.tt/8YoCUAB (107MB). Having never had the occasion to distribute large files before, I can’t say anything about the file sharing site I have used. As would be standard, the file is provided without any warranty or claim of functionality – if your computer turns into an Android and takes over the world, I take no responsibility! 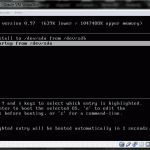 Here’s a blog article (based on the above one) which guides you through the compilation procedure of ICS with Intels x86 (hardware-assisted) Linux Kernel for the emulator-x86. Just out of curiousity, how much did the bill from Amazon come out to for this? Was it close to the $0.45 you estimated? I’m looking at doing this for regular ICS builds for a couple of ARM devices and I don’t have a big machine at the moment. Well, that depends on what you include in the ‘bill’. Amazon doesn’t charge for incoming data – so the download was free – the main cost was the instance, and there is a minor cost to upload the final product from the instance. It really did take me two instance hours (I think it was about an hour and a half or so) to do everything start to finish, so $0.45 was fairly close (within a cent or so) to the cost. However, I didn’t get it right on my first try – between the Android server being overloaded (couldn’t download a full copy of the code the first few tries) and having never worked with Android before, I spent an additional 14 hours (and $2.44 – I used both c1.xlarge and m2.xlarge for testing) trying to figure it all out and get things to work. The cost of $0.45 was how much it would take to follow the procedure outlined in one go. There shouldn’t be any additional costs – but if there were, they would be buried in my regular monthly AWS bill. 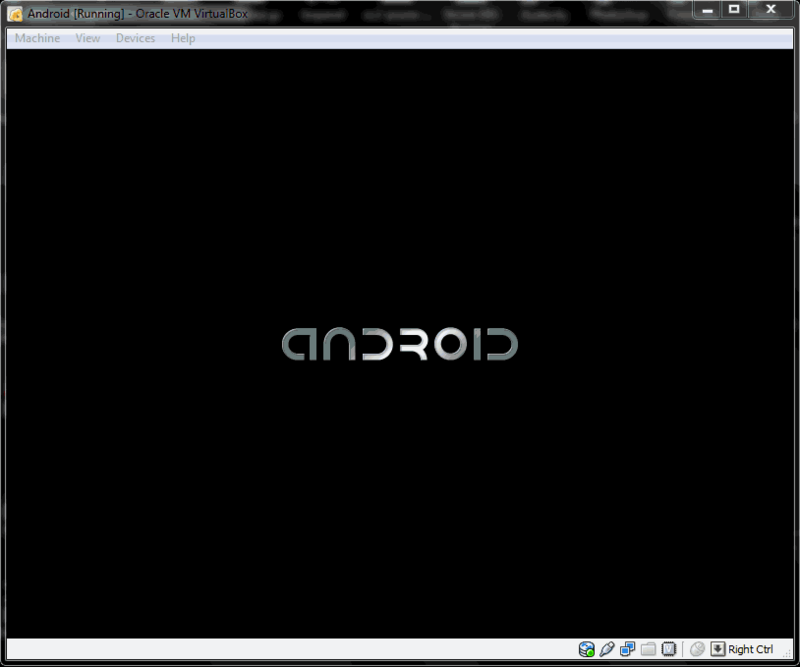 I build android ICS for virtualbox as your wrote above and it did works. However, I am facing a problem that the resolution changing will cause “Unfortunately, system UI has stopped” error. The resolution is 800×600 as default, everything works fine with this resolution. But if I change it to 1280×800 or else via “vga=ask”, then I will get the system UI error when it started. Do you have any idea? Thanks a lot. Sorry, I haven’t come across that issue before. I don’t use Android a lot – the objective of the build was more to see that it could be done and what it would entail than because I actually wanted to make use of it. I’d try some of the Android mailing lists and you might have more success. This is a very useful tutorial, thanks for contributing. I probably do something wrong… but i followed all of your tutorial and when i launch my .vdi all came up is “GRUB” without anything else…. Quite possible that some of the steps have changed between Ice Cream Sandwich and KitKat. 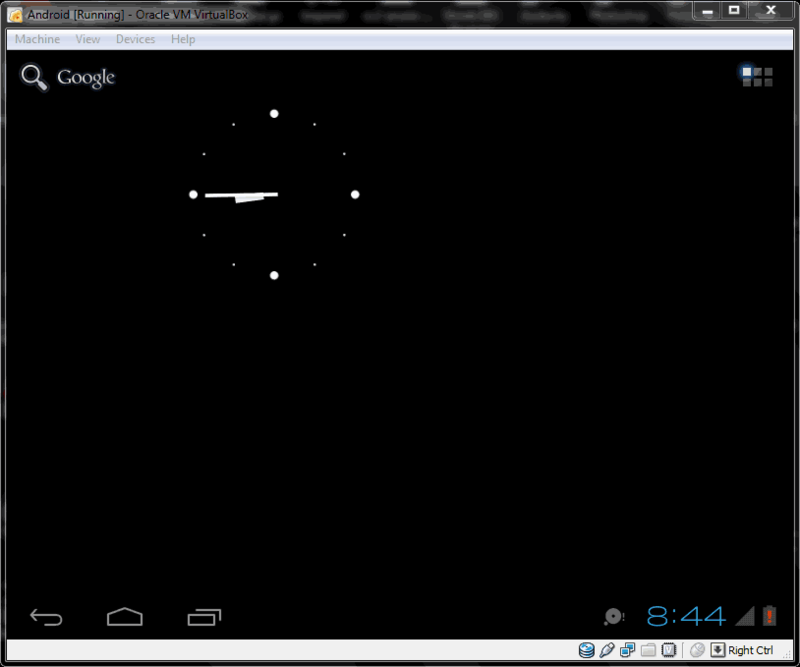 I haven’t had a chance to try this on a later version of Android, unfortunately. It definitely can be made to work, so keep at it, and you’ll get there eventually. Great to see that you are making progress. Hey, I am also facing the same problem. How did you solve it, can you please help me. Thanks in advance. I am facing the same issue, please tell me how did you resolved it. Thanks in advance. Wow, that’s what I was looking for, what a stuff! existing here at this blog, thanks admin of this site.